This year, on May 1 to be precise, I will celebrate ten years in Italy. Ten years since I lugged a large case and several other bags up the three flights of stairs in Via del Babuino only to be told by Angelica, the art student that rented a room from my friend Colinette, who happened to be in Australia, that if I crossed the threshold she would call the police. At that point I started wishing I had not brought so much with me. I had already worried my mother when I told the check in staff that my luggage included a cook’s knife (carefully wrapped at the bottom of my huge case) but I also had sketching materials, books, shoes I was perhaps not going to have the occasion to wear, and the sort of heavy coat an Antipodean feels they need for a year in Europe. There are stories I told a million times during that first what was meant to be one year. Always on the lookout for the slightest opportunity to practice my Italian, it didn’t take long to realize that older gentlemen in bars; the ones that call you signorina and smile when you tell them you are Australian, were the best conversation partners. “Ho studiato l’Italiano a scuola elementare” I would tell them earnestly, explaining how the Italian Government had paid for Italian to be taught in primary schools in areas where there were a lot of Italian immigrant families, partly to keep the language alive across the world, and partly to teach people ‘Dante’s Italian’ as opposed to local dialects. Those dialects, along with the accents and intonations that define each region of Italy still exist, as my journey into the heart of the Italian language was going to show me. Alongside the language there was always the food, and I quickly realized just how regional that was too; how each of the twenty regions in Italy, and all the provinces within them and the cities and towns that populate them right down to the smallest borghi – have their own culinary traditions that revolve around the land and the seasons, a kind of gastronomic terroir if you like. Often this involves regional interpretations of the same ingredient or dish, with the reasons for the subtle changes most often due to geographic reasons, but also to cultural influences. This is where I found everything starting to get terribly interesting, because seeing as Italy until 1870 was ruled by various different powers, the linguistic influences are varied around the country and some fruit and vegetables have different names up and down the peninsula depending on whether they were ruled by the Hapsburgs or the Bourbon kings. 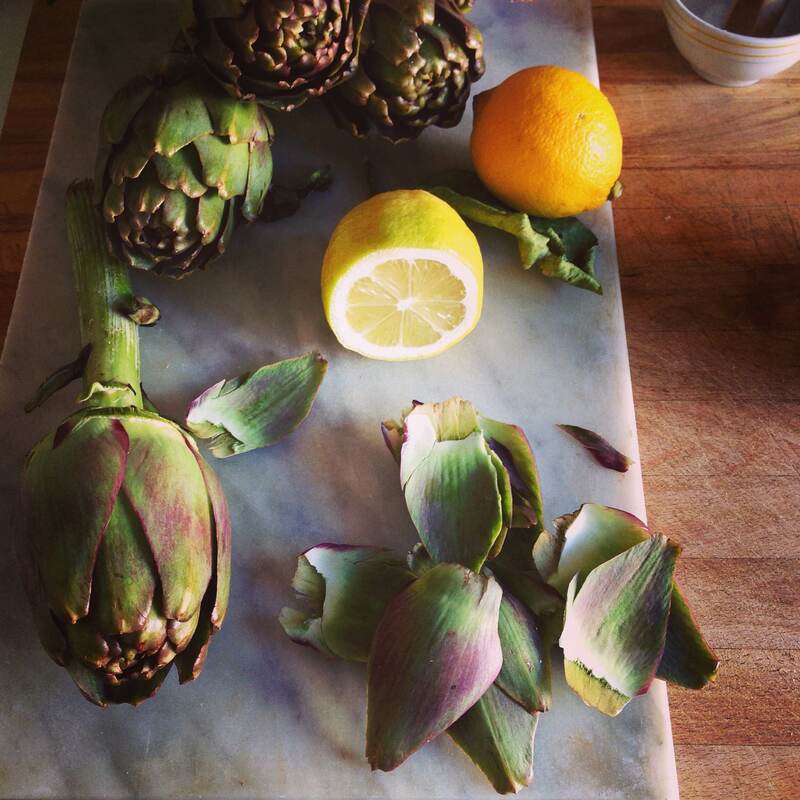 If I were to think of Rome and had to choose the item that most defines the Roman table, I would choose carciofi, artichokes, as the centerpiece. But while carciofi in many guises (fried, sautéed, stewed) are perhaps the most Roman of Roman piatti, they are grown and eaten all over Italy. In the middle of winter, that is now, a thinner, more tulip shaped variety is prevalent, and these are grown in Puglia, in Sardegna and in Sicily. Generally from about February on what Romans call the Carciofi Romaneschi; the super plump globe variety start to appear. And when I was in Venice last year I was told about yet another variety; the very special small violet variety that grow on Sant’Erasmo island in the lagoon, which is, as it has been for centuries, the market garden of Venice. I am working on a way to get back to Venice to try these – they come out really late, from about Easter onwards and have been ‘castrated’ so to speak so are without the spiny central choke. In Venice, which has a vastly different dialect to other parts of Italy, carciofi are known as articiochi, linguistic cousin of the french artichaut and the English artichoke. 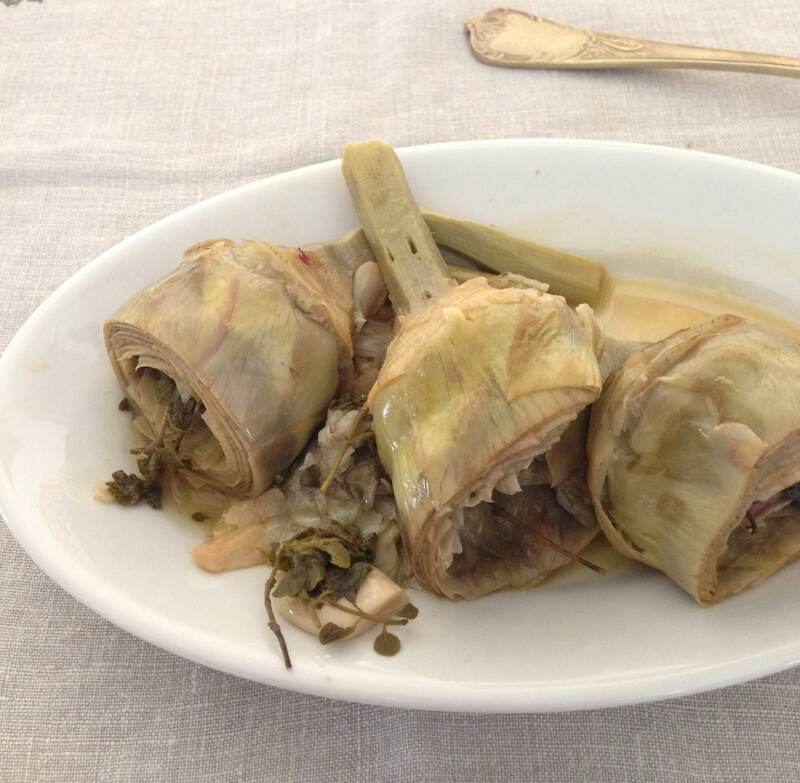 They were supposedly introduced by Venice’s Jewish population, and in Rome Carciofi alla Giudea; the delicious double fried artichokes in the prima donna of Roman Jewish food. To be in Rome in winter or spring and cut into the crispy on the outside butter soft on the inside of a Carciofo alla Giudea in one of the restaurants along Via del Portico D’Otavio in the Roman Ghetto is to enjoy a uniquely Roman experience. 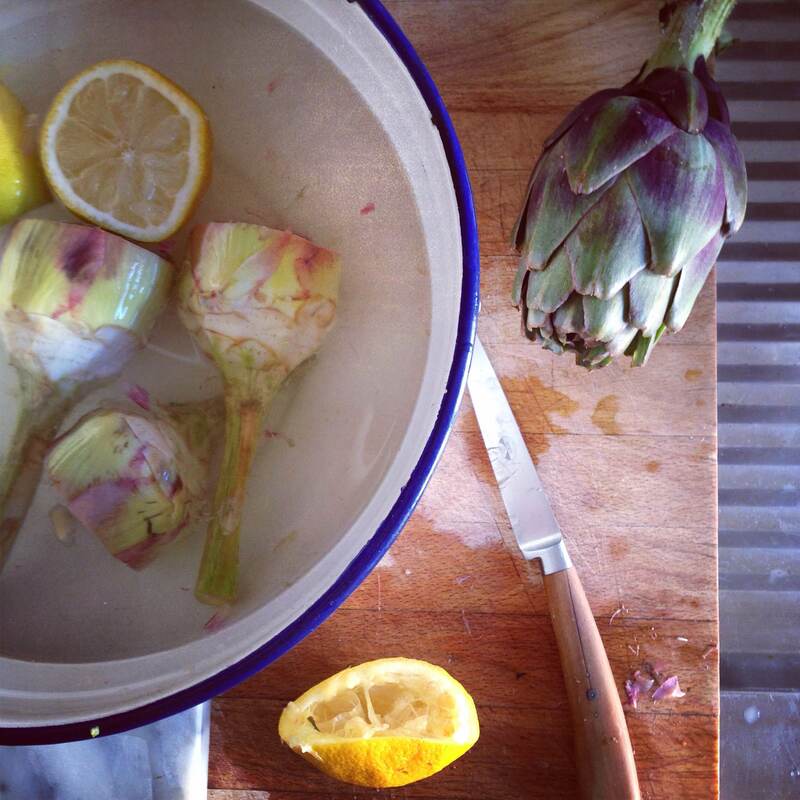 Carciofi alla Romana, artichokes sautéed in oil and wine are a more suited to cooking at home. Prepare a bowl of cold water with the juice of 1 lemon and have another halved lemon ready to spritz the artichokes as they are cleaned. Have a small paring knife to hand. Every time I prepare artichokes I get a little bit more courageous with the removal of the outer leaves and the results are always better. Take a deep breath and pull of at least two layers of the outer leaves to reveal the softer looking inner leaves. The stalk stripped back so that only the inner part remains, and use the paring knife to clean up the ‘collar’ where the stalk meets the flower . The top of each artichoke should be cut off at just over the half way point because the tops of the petals remain too tough to eat and then the inside of the flower needs to be scraped out using a teaspoon as these inner petals are also tough and spiky. As each one is cleaned it should be spritzed with lemon and placed in the bowl of water. Each artichoke gets stuffed with a clove of garlic, some parsley and mint. The Romans use mentuccia, a local wild mint but another herb like parsley or oregano will do. Heat some extra virgin olive oil in a heavy based saucepan with a lid. Coat artichokes with oil quickly, arrange on their sides or stalk up so that they fit well, bring up to a high heat and splash in some white wine and a cup of water and put the lid on to cook. Lower the flame to a low heat and turn regularly. They should be turned a couple of times to ensure even cooking and will take about 15-20 minutes to cook depending on size. To serve add some more chopped herbs, extra virgin olive oil to the juices.